The Republic of Macedonia, often referred to as Macedonia, is a landlocked country on the Balkan peninsula in southeastern Europe. The lands governed by the republic were the southernmost part of the Socialist Federative Republic of Yugoslavia. 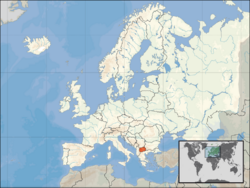 Its borders were fixed shortly after World War II when the Anti-Fascist Assembly for the National Liberation of Macedonia declared the People's Republic of Macedonia as a separate nation within Yugoslavia. The United Nations, to which it was admitted in 1993, and other international institutions and countries use the provisional reference "the Former Yugoslav Republic of Macedonia" (F.Y.R.O.M. ), pending resolution of a naming dispute with Greece. Macedonia is located at "the crossroads between East and West," resulting in a turbulent history. The ebb and flow of empires in the Balkans over the centuries has left a complex ethnic and religious composition, which has made efforts at peace and reconciliation a difficult task. The Republic of Macedonia is a landlocked country that is geographically clearly defined by a central valley formed by the Vardar river and framed along its borders by mountain ranges. It is bordered by Serbia to the north, Albania to the west, Greece to the south, and Bulgaria to the east. With a land area of 9779 square miles (25,333 square kilometers), the Republic of Macedonia is slightly larger than the state of Vermont in the United States. The Republic's terrain is mostly rugged, located between the Šara and Osogovo mountains, which frame the valley of the Vardar River. Three large lakes—Lake Ohrid, Lake Prespa and Dojran Lake—lie on the southern borders of the republic, bisected by the frontiers with Albania and Greece. Ohrid is considered to be one of the oldest lakes in the world. The Republic of Macedonia has scenic mountains which belong to two different ranges: Dinarska and Rodopska. 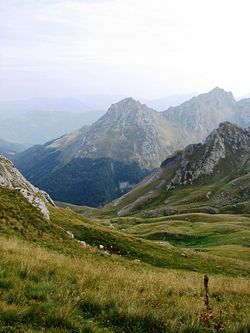 The Dinarska range is the oldest; the Rodopska range is younger offering rugged, alpine scenery. The highest point is Golem Korab (Maja e Korabit) at 9068 feet (2764 meters). Macedonia has three main climatic zones: temperate Mediterranean, mountainous and mildly continental. The summers are hot and dry and the winters are moderately cold. Average annual precipitation varies from 67 inches (1700mm) in the western mountainous area to 20 inches (500mm) in the eastern area. Snowfalls can be heavy in winter. Temperatures average 32°F (0°C) in January (winter) and rise to 68°–77°F (20°–25°C) in July (summer). The warmest region is the Demir Kapija and Gevgelija region, where the temperature in July and August frequently exceeds 104°F (40°C). Most of Macedonia drains south-east into the Aegean Sea, via the Vardar River and its tributaries. Smaller parts drain into Lake Doiran and into the Aegean via the Strumica and Struma rivers. The remainder drains north via the Crni Drim River to the Adriatic. Fauna include European bison, fox, rabbits, brown bears, and deer. Ducks, turtles, frogs, and muskrats inhabit the country's waterways. Natural resources include low-grade iron ore, copper, lead, zinc, chromite, manganese, nickel, tungsten, gold, silver, asbestos, gypsum, timber, and arable land. The region is seismically active and has been the site of destructive earthquakes in the past, most recently in 1963 when Skopje was heavily damaged by an earthquake, killing over 1,000 people. Environmental issues concern air pollution from metallurgical plants. Skopje is the capital and largest city, with 500,000 inhabitants or more than a quarter of the population of the country, as well as the political, cultural, economical and academic center of the country. It was known from the Roman period under the name Scupi. 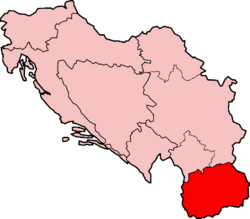 There are a number of smaller cities, notably Bitola, Kumanovo, Prilep, Tetovo, Ohrid, Veles, Štip, Kočani, Gostivar and Strumica. (Crkvište - Morobisdon) archeological site near Kocani. Alexander the Great statue in the center of Prilep. Byzantine Emperor Justinian the Great, born in Tauresium, near Skopje. 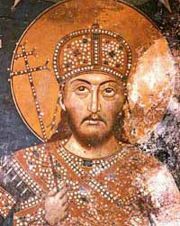 Fresco of Serbian Czar Stefan Uroš IV Dušan. The region that today forms the Republic of Macedonia has been inhabited since Paleolithic times. It was settled predominantly by the Paionians, Dardani and other tribes of mixed Thraco-Illyrian origin. The Paionians settled in the central Balkans in the valleys of the rivers Struma, Vardar and Bistrica around 4000-3500 B.C.E. At some point thereafter, the Paionian tribes coalesced into a kingdom centered in the central and upper reaches of the Vardar and Struma rivers. They joined with the Illyrians in resisting the northward expansion of the Macedon. In 360-359, southern Paionian tribes were launching raids into Macedon in support of an Illyrian invasion. Under Philip II of Macedon, (359–336 B.C.E. ), Macedon, centered in today's Central Greek Macedonia, expanded into the territories of the Paionians, Thracians, and Illyrians. Among other conquests, Philip II annexed the regions of Pelagonia and Southern Paionia (these regions respectively correspond to the most southern parts of today Republic of Macedonia). The kingdom of Paionia was reduced to a semi-autonomous, subordinate status. Philip's son Alexander the Great (356–323 B.C.E.) managed briefly to extend Macedonian power not only over the Balkans, but also to the Persian Empire, including Egypt, and to the fringes of the Indian subcontinent. In 280 B.C.E., the Gallic invaders ravaged the land of the Paionians, who being further hard pressed by the Dardani, join the Macedonians, whose downfall they shared. Generally the Paionians continued to live autonomously until the coming of the Romans. 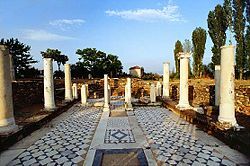 The Roman province of Macedonia was officially established in 146 B.C.E., after the Roman general Quintus Caecilius Metellus defeated Andriscus of Macedon in 148 B.C.E., and after the four client republics established by the Roman Republic in the region were dissolved. The province incorporated Epirus Vetus, Thessaly, and parts of Illyria and Thrace. In the third or fourth century, the province of Macedonia was divided into Macedonia Prima (in the south) and Macedonia Salutaris (in the north). The Dardani in north never felt under Macedonian rule, but they were conquered by the Romans in 128 B.C.E. and its territory became part of the Roman province of Moesia Superior. By 400 C.E., the Paionians had lost their identity, and Paionia was merely a geographic term. The Byzantine Empire is the term conventionally used to describe the Greek-speaking Roman Empire of the Middle Ages, centered on its capital of Constantinople. Many consider Emperor Constantine I (reigned 306 C.E. –337 C.E.) to be the first "Byzantine Emperor." It was he who moved the imperial capital in 324 from Rome to Byzantium, refounded as Constantinople, or Nova Roma ("New Rome"). Some date the beginnings of the empire to the reign of Theodosius I (379–395) and Christianity's official supplanting of the pagan Roman religion, or following his death in 395, when the political division between East and West became permanent. South Slavic tribes settled in the territory of the present-day Republic of Macedonia in the sixth century]], pushing out some existing populations, while many others were assimilated. These included Greek, Latin, Illyrian and Thracian-speaking inhabitants. The Slavic invaders of Byzantine Macedonia organized themselves in autonomous rural societies called by the Greeks Scaviniai. The Sklavines participated in several assaults against the Byzantine Empire - alone or aided by Bulgars or Avars. 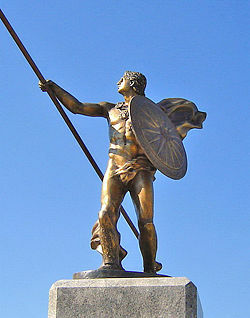 They succeeded in conquering virtually all of Greece except for Thessaloniki and Athens. They continued to occupy Macedonia, Thrace, Moesia, and most of Greece proper. The Byzantine emperors would aim to Hellenize and incorporate the Skavinai into the socio-economic rule of Byzantium. While Byzantine achieved this with the Slavs of the Thracian theme, the emperors had to resort to military expeditions to pacify the Skavinai of Macedonia, often repeatedly. 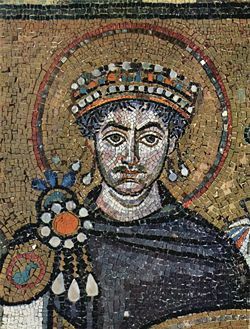 In the late seventh century, Macedonian-born Justinian the Great (482/483–565), organized a massive expeditions against the Sklaviniai of the Greek peninsula, in which he reportedly captured over 110,000 Slavs and transferred them to Cappadocia. By the time of Constans II (630-668), who also organized campaigns against the Slavs, the significant number of the Slavs of Macedonia had been captured and transferred to central Asia Minor where they were forced to recognize the authority of the Byzantine emperor and serve in its army. The majority remained independent, and continued to form the demographic majority in the region. There are no Byzantine records of "Sklavines" after 836, as the Slavs of Macedonia were assimilated into the First Bulgarian Empire (632-1018). Slavic influence in the region strengthened along with the rise of this state, which incorporated entire region to its domain in 837. Saints Cyril and Methodius, Byzantine Greeks, born in Thessaloniki, were the creators of the first Slavic Glagolitic alphabet and Old Church Slavonic language, and were apostles to the Slavic world. 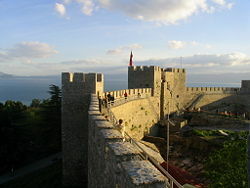 Their cultural heritage was acquired and developed in medieval Bulgaria, where after 885 the region of Ohrid became a significant ecclesiastical center. At the end of the tenth century, much of what is now Republic of Macedonia became the political and cultural center of the First Bulgarian Empire under tsar Samuil (997-1014), while the Byzantine emperor Basil II (958-1025) conquered the eastern part of the empire (what is now Bulgaria), including the capital of Preslav, in 972. A new capital was established at Ohrid, which also became the seat of the Bulgarian Patriarchate. From then on, the Bulgarian culture became an integral part of the Slav culture as a whole. After several decades of almost incessant fighting, Bulgaria came under Byzantine rule in 1018. The whole of Macedonia was incorporated into the Byzantine Empire. The Byzantines resumed full control of the Balkans by the early eleventh century, but by the late twelfth century Byzantine decline brought about the birth of the Second Bulgarian Empire. The empire soon encountered political difficulties, and in thirteenth century the wider geographical Macedonia region fell once again under Byzantine control. In the fourteenth century, it became part of the Serbian Empire, which saw itself as liberating slavic kin from the despotism of Byzantine. Culture and Christianity flourished once again. Skopje became the capital of the empire of Serbian Czar Stefan Dusan(1308-1355). However, with his death, his weak successor and power struggles between nobles divided the Balkans once again. This coincided with the entry of the Ottoman into Europe. The Ottoman Empire started in a small emirate in the late thirteenth century in northwestern Anatolia. The Ottoman Turks first crossed into Europe in 1354. The Byzantine Empire, which had ruled most of the Greek-speaking world for over 1100 years, had been fatally weakened since the sacking of Constantinople by the Crusaders in 1204. The Ottoman Empire defeated Serbian states in the Battle of the Maritsa River in 1371, and defeated a combined army of Serbs, Albanians, and Hungarians in 1389. By the end of the fourteenth century, the Macedonian region had been incorporated into the Ottoman Empire, and remained so for nearly 500 years, changing language, food habits, and many aspects of daily living in Macedonia. During the Ottoman rule, Skopje and Monastir (Bitola) were capitals of separate Ottoman provinces (eyalets). Ottoman rule over the region was considered harsh. Settlers were moved between regions with no regard for links between ethnicity and territory. Under the devsirme (“blood tax”) system, Christian children were taken, Islamized, and assigned to the Turkish army and administration. The Ottoman timar economic system, under which local officials raised revenue or supported troops in the sultan's name, resulted in a population that was influenced by Ottoman culture yet oppressively subordinated to Turkish landlords. The valley of the river Vardar, which was later to become the central area of the Republic of Macedonia, was liberated from Ottoman rule after the Russo-Turkish War of 1877-1878, becoming part of Bulgaria. As the Turkish empire decayed towards the end of the nineteenth century, Serbia, Greece, and Bulgaria all hoped to benefit from any approaching carve-up of Macedonia. Several movements seeking an autonomous Macedonia began to arise. The earliest of these was the Bulgarian Macedonian-Adrianople Revolutionary Committees, founded in 1893, and later transformed into SMORO. In 1905, it was renamed as IMORO and after World War I the organization separated into the IMRO and the ITRO. Officially open to all the disgruntled elements in Macedonia and the Adrianople region, regardless of their nationality, most members were Slavic/Bulgarian-speakers. 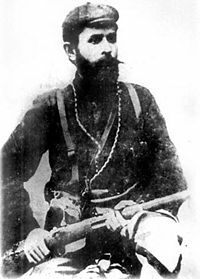 In 1903, a short-lived Kruševo Republic was proclaimed in the south-western part of present-day Republic of Macedonia by the rebels of the Ilinden-Preobrazhenie Uprising. This first modern-day republic in the Balkans lasted for 10 days from August 3, 1903, was headed by president Nikola Karev (1877-1905), and was brutally crushed. The Great Powers sent officers to supervise Ottoman forces. The uprising and the forming of the Krushevo Republic are considered the cornerstone and precursors to the eventual establishment of the Republic of Macedonia. The Balkan Wars were two wars in South-eastern Europe in 1912–1913. The first war started when the Balkan League (including Bulgaria, Montenegro, Greece, and Serbia) intervened in an uprising of Albanians in October 1912, to conquer Ottoman-held Macedonia, Albania and most of Thrace, and partition those territories) among them. 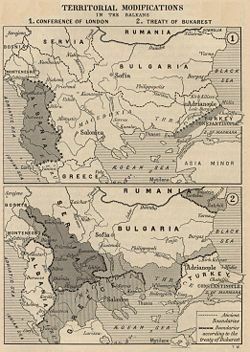 The Treaty of London, in May 1913, at the end of the First Balkan War, displeased Bulgaria, and when that nation tried to enforce a new partition in a Second Balkan War, the Treaty of Bucharest, in August 1913, confirmed a pattern of boundaries that has largely remained in force ever since. 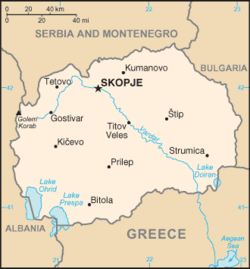 The territory of the present-day Republic of Macedonia was then named Južna Srbija, "Southern Serbia." Distribution of ethnic groups in the Balkan Peninsula and Asia Minor in 1923. The region was engulfed in World War I, a global military conflict which took place primarily in Europe from 1914 to 1918. Over 40 million casualties resulted. The Entente Powers, led by France, Russia, the British Empire, and later Italy (from 1915) and the United States (from 1917), defeated the Central Powers, led by the Austro-Hungarian, German, and Ottoman Empires. During that war, Bulgaria occupied large parts of Macedonia, and the partition of 1913 was reconfirmed at the end of World War I. After that war, Serbia became part of the Kingdom of Serbs, Croats and Slovenes. In 1929, the Kingdom was officially renamed the Kingdom of Yugoslavia and divided into provinces called banovinas. So-called "Southern Serbia" (Vardar Macedonia), including all of what is now the Republic of Macedonia, became known as the Vardar Banovina of the Kingdom of Yugoslavia. World War II was a worldwide military conflict, the amalgamation of what had been two separate conflicts. The first began in Asia in 1937 as the Second Sino-Japanese War; the other began in Europe in 1939 with the German invasion of Poland. This global conflict split the majority of the world's nations into two opposing military alliances: the Allies and the Axis Powers. Spanning much of the globe, World War II resulted in the death of over 70 million people, making it the deadliest conflict in human history. During World War II, the Vardar Banovina was occupied between 1941 and 1944 by Italian-ruled Albania, which annexed the Albanian-populated western regions, and pro-German Bulgaria, which occupied the remainder. Local recruits and volunteers formed the Bulgarian Fifth Army, based in Skopje, which was responsible for the round-up and deportation of over 7,000 Jews in Skopje and Bitola. The occupying powers persecuted those inhabitants of the province who opposed the regime; this prompted some of them to join the Communist resistance movement of Josip Broz Tito (1892-1980). The Bulgarian army was partially recruited from the local population, which formed as much as 40 percent of the soldiers in certain battalions. Following World War II, Yugoslavia was reconstituted as a federal state under the leadership of Tito's Yugoslav Communist Party. When the former Vardar province was established in 1944, most of its territory was transferred into a separate republic while the northernmost parts of the province remained with Serbia. In 1946, the new republic was granted federal status as an autonomous "People's Republic of Macedonia" within the new Socialist Federal Republic of Yugoslavia. In the 1963 Constitution of Yugoslavia, it was slightly renamed, to bring it in line with the other Yugoslav republics, as the Socialist Republic of Macedonia. Greece was concerned by the initiatives of the Yugoslav government, as they were seen as pretext for future territorial claims against the Greek province of "Northern Greece" which formed the bulk of historical Macedonia and was also officially called 'Macedonia'. The Yugoslav authorities also promoted the development of the Macedonians' ethnic identity and Macedonian language. The Macedonian language was codified in 1944, from the Slavic dialect spoken around Veles. This further angered both Greece and Bulgaria, because of the possible territorial claims of the new states to the Greek and Bulgarian parts of the region of Macedonia received after the Balkan Wars. During the Greek Civil War (1944-1949), many Macedonians (regardless of ethnicity) participated in the resistance movement organized by the Greek Communist Party. ELAS and Yugoslavia were on good terms until 1949, when they split as a result of Tito's divergence from Soviet leader Joseph Stalin (known as the Cominform dispute). After the end of the war, the ELAS fighters who took refuge in southern Yugoslavia and Bulgaria were not all permitted to return to Greece: only those who considered themselves Greeks were allowed, whereas those who considered themselves Bulgarians or Macedonians were barred. These events also contributed to the bad state of Yugoslav-Greek relations in Macedonia. Macedonia Square in central Skopje. On September 8, 1991, the Socialist Republic of Macedonia held a referendum that established its independence from Yugoslavia, under the name of the Republic of Macedonia. Bulgaria was the first country to recognize the new state under its constitutional name. However, international recognition of the new country was delayed by Greece's objection to the use of what it considered a Hellenic name and national symbols, as well as controversial clauses in the Republic's constitution. To compromise, the United Nations recognized the state under the name of "the former Yugoslav Republic of Macedonia" in 1993. More than half the UN's member states have recognized the country as the Republic of Macedonia, including the United States of America while the rest use the temporary reference "the former Yugoslav Republic of Macedonia," or have not established any diplomatic relations with Macedonia. Greece was still dissatisfied and it imposed a trade blockade in February 1994. The sanctions were lifted in September 1995 after Macedonia changed its flag and aspects of its constitution that were perceived as granting it the right to intervene in the affairs of other countries. The two neighbors immediately went ahead with normalizing their relations, but the state's name remains a source of local and international controversy. The usage of each name remains controversial to supporters of the other. In 1999, the Kosovo War led to 340,000 Albanian refugees from Kosovo fleeing into Macedonia, greatly disrupting normal life in the region and threatening to upset the balance between Macedonians and Albanians. Refugee camps were set up in Macedonia. Meanwhile, Athens rallied behind Skopje and allowed Greek Macedonia to be used as a transit corridor for NATO forces moving to the region ahead of a possible invasion of Serbia. Thessaloniki became the main depot for humanitarian aid to the region. The republic itself did not become involved in the conflict. The Serbian government under president Slobodan Milošević capitulated and the refugees were allowed home under UN protection. However, the war increased tensions and relations between ethnic Macedonians and Albanian Macedonians became strained. A short conflict was fought between the Macedonian government and ethnic Albanian rebels, known as the National Liberation Army, mostly in the north and west of the country, between March and June 2001. This war ended with the intervention of a NATO ceasefire monitoring force. In the Ohrid Agreement, the government agreed to devolve greater political power and cultural recognition to the Albanian minority. The Albanian side agreed to surrender separatist demands and to fully recognize all Macedonian institutions. In addition, according to this accord, the NLA were to disarm and hand over their weapons to a NATO force. In 2005, the country was officially recognized as a European Union candidate state, under the reference "Former Yugoslav Republic of Macedonia." Official flag between 1992 and 1995. Official flag of the Republic of Macedonia revised since 1995. The Republic of Macedonia is a parliamentary democracy. The president, whose role is mostly ceremonial, is elected by popular vote for a five-year term, and is eligible for a second term. The prime minister is elected by the assembly following legislative elections. The Council of Ministers elected by the majority vote of all the deputies in the Assembly. The unicameral Assembly, or Sobranie, has 120 members elected by popular vote for four-year terms from party lists based on the percentage of the overall vote the parties gain in each of six electoral districts to serve four-year terms. Suffrage is universal for those aged 18 years and over. Judicial power is exercised by courts, with the court system being headed by the Judicial Supreme Court, Constitutional Court, and the Republican Judicial Council. The assembly appoints the judges. Although the judiciary is officially independent from the political system, the perceived lack of independence is a problem. The legal system is based on civil law system; judicial review of legislative acts. Macedonia has not accepted compulsory International Court of Justice jurisdiction. The Republic of Macedonia has a multi-party system, with numerous parties which must cooperate to form coalition governments. In the 2006 legislative election, a Coalition of Internal Macedonian Revolutionary Organization–Democratic Party for Macedonian National Unity took 38 seats, the Liberal Party of Macedonia took two seats, the Socialist Party of Macedonia took three seats, a coalition called Together For Macedonia headed by the Social Democratic Union of Macedonia took 23 seats, a further coalition headed by the Democratic Union for Integration took 14 seats, and the Democratic Party of Albanians took 11 seats. With the passage of a new law and elections held in 2005, local government functions were divided between 78 municipalities (општини, opštini; singular: општина, opština). The capital, Skopje, is governed as a group of ten municipalities collectively referred to as the "City of Skopje." Municipalities in the Republic of Macedonia are units of local self-government. Neighboring municipalities may establish cooperative arrangements. Macedonia's statistical regions are: Skopje, Pelagonia, Polog, Eastern, Southeastern, Northeastern, Southwestern, and Vardar. The Republic of Macedonia under the name "Former Yugoslav Republic of Macedonia" (F.Y.R.O.M.) is a member of a number of international organizations such as the United Nations, Organization for Security and Cooperation in Europe, the Council of Europe, associate member of La Francophonie, and the World Trade Organization (WTO) among others. It is seeking to join NATO and the European Union, although its accession to either is unlikely to occur before 2008 and 2012, respectively. In December 2005, the leaders of the EU formally named it as a candidate country but did not set a date for starting entry talks. The United States Agency for International Development has underwritten a project called "Macedonia Connects" which has made the Republic of Macedonia the first all-broadband wireless country its size or larger in the world. The Ministry of Education and Sciences reports that 461 schools (primary and secondary) are now connected to the internet. In addition, an Internet Service Provider (On.net), has created a MESH Network to provide WIFI services in the 11 largest cities/towns in the country. The Republic of Macedonia has an economy that can meet its basic food needs but depends on outside sources for all of its oil and gas and most of its modern machinery and parts. The most important sectors are agriculture and industry. The people of Macedonia have a mid-range standard of living, according to international rankings. Macedonia ranks 59th in the 2006 HDI, 89th on The Economist's 2005 world-wide quality-of-life index, and it has an average per capita income of $7645 in 2006, a rank of 87 on the IMF list of 179 countries. The unemployment rate was 36 percent 2006, and 30 percent of the population existed below the poverty line. At independence in September 1991, Macedonia was the least developed of the Yugoslav republics, producing a mere five percent of the total federal output of goods and services. The collapse of Yugoslavia ended transfer payments from the central government and eliminated advantages from inclusion in a de facto free trade area. An absence of infrastructure, United Nations sanctions on the downsized Yugoslavia, and a Greek economic embargo over a dispute about the country's constitutional name and flag hindered economic growth until 1996. Since the end of the Greek embargo, Greece has become the most important business partner of the Republic of Macedonia. Many Greek companies have bought former state companies in the country, such as the oil refinery Okta, the baking company Zhito Luks, a marble mine in Prilep, and textile facilities in Bitola. GDP subsequently rose each year through 2000. However, the leadership's commitment to economic reform, free trade, and regional integration was undermined by the ethnic Albanian insurgency of 2001. The economy shrank 4.5 percent because of decreased trade, intermittent border closures, increased deficit spending on security needs, and investor uncertainty. Growth barely recovered in 2002 to 0.9 percent, then averaged 4 percent per year during 2003-2006. 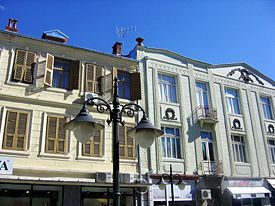 The architecture in the city of Bitola. The service sector also grew in the past few years. The work force has competitive education and skills, but lacks adequate jobs, leading to steady brain drain. The country's economic policy is to attract foreign investments and to increase employment. One of the biggest features of the country's economy is the fiscal discipline which maintained a stable currency for a long period. The country also makes efforts to develop the small and medium-sized enterprise sector. In addition, it faced many of the same problems faced by other former socialist East European countries during the transition to a market economy. Its main land and rail exports route, through Serbia, remains unreliable with high transit costs, thereby affecting the export of its formerly highly profitable, early vegetables market to Germany. Unemployment, the extensive gray market, estimated to be more than 20 percent of GDP, that falls outside official statistics, corruption and a relatively ineffective legal system keep the growth rate low and cause significant problems. The government announced plans to introduce flat tax system with the intention to make the country more attractive location for prospective foreign investors. The flat tax rate will amount to 12 percent in 2007 and will be further lowered to ten percent in 2008. Exports totaled $2.396-billion in 2006. Export commodities included food, beverages, tobacco; textiles, miscellaneous manufactures, iron and steel. Export partners included Serbia and Montenegro 23.2 percent, Germany 15.6 percent, Greece 15.1 percent, Italy 9.9 percent, Bulgaria 5.4 percent, and Croatia 5.2 percent. Imports totaled $3.682-billion in 2006. Import commodities included machinery and equipment, automobiles, chemicals, fuels, food products. Import partners included Russia 15.1 percent, Germany 9.8 percent, Greece 8.5 percent, Serbia and Montenegro 7.5 percent, Bulgaria 6.7 percent, and Italy 6 percent. Ethnic groups in the Republic of Macedonia, according to the 2002 census. Macedonia's total population in 2006 was 2,038,514. The Albanian population increased from eight percent of the population after World War II to 25 percent in the 1990s, resulting in conflict and reforms that decentralized the government. The median age for the total population was 34.4 years in 2007. About 58 percent of the population living in urban areas. Macedonians had an average life expectancy at birth of 74.21 years (71.73 years for males and 76.88 years for females) in 2007. Liturgy is read at Church of Saint Sophia, Ohrid in Ohrid. The majority (64.7 percent) of the population belonged to the Macedonian Orthodox Church in 2002, 33.3 percent were Muslim, 0.37 percent were other Christian, while 1.63 percent were other and unspecified. Altogether, there are more than 1,200 churches and 400 mosques in the country. The Orthodox and Islamic religious communities have secondary religion schools in Skopje. There is an Orthodox theological college in the capital. The Macedonian Orthodox Church is the body of Christians who are united under the Archbishop of Ohrid and Macedonia. It declared autocephaly from the Serbian Orthodox Church in 1967, but remains unrecognized by Orthodox churches. It has ten provinces (seven in the country and three abroad), ten bishops, and about 350 priests. 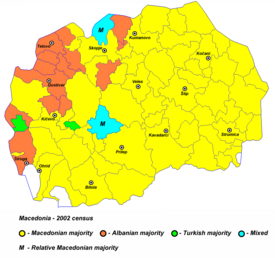 Macedonians, who are the majority of the population, are Christian Orthodox. Most of the native Albanians, Turks and Bosniaks are Muslims, as are a minority of the country's ethnic Macedonian population, known as Macedonian Muslims. Percentagewise, the country has the largest Muslim population in Europe after Turkey, Albania and Bosnia and Herzegovina. The Macedonian Byzantine Catholic Church (also known as the Macedonian Greek Catholic Church) has approximately 11,000 adherents in the Republic. The Church was established in 1918, and is made up mostly of converts to Catholicism and their descendants. The Church is of the Byzantine Rite and is in communion with the Roman and Eastern Catholic Churches. Its liturgical worship is performed in Macedonian. The Jewish community of the Republic of Macedonia, which numbered some 7,200 people on the eve of World War II, was almost entirely destroyed during the War, with only two percent of Macedonian Jews surviving the Holocaust. After their liberation and the end of the War, most opted to emigrate to Israel. In 2007, the country's Jewish community numbered approximately 200 people, almost all of whom live in Skopje. Most Macedonian Jews are Sephardic - the descendants of fifteenth century refugees who had fled the Spanish and Portuguese Inquisitions. There is a small Protestant community. The most famous Protestant in the country is the former president Boris Trajkovski. He was from the Methodist Community, which is the largest and oldest Protestant Church in the Republic, dating back to the late nineteenth century. Ethnic Macedonian girl in traditional folk dress. Ethnic Macedonians dancing the "Teshkoto" folk dance. Other languages including Albanian, Bulgarian, Romani, Turkish, Serbian, Vlach (Aromanian and Megleno-Romanian), Circassian, Greek and others are spoken roughly in proportion with their associated ethnic groups. Macedonian is the only language explicitly designated as an official national language in the constitution. It also provides however that languages spoken by over 20 percent of the total population are also official - in 2007, only Albanian fulfils this requirement. Additionally, in municipalities where at least 20 percent of the population is from other ethnic minorities, their individual languages are used for official purposes in local government. While both men and women work outside the home, women are responsible for domestic labor. At university, men dominate the sciences and engineering, whereas women are more visible in the humanities. Legally the genders are equal, but men have higher status, and women are likely to manage the household. Some women occupy positions of power. Marriages were once arranged by the parents, but by the late twentieth century young people were likely to choose their own partners, mostly from their own religious background. Traditionally, the bride is expected to be a virgin, but in practice pregnancy often leads to marriage among urban youth. Some Muslims practise polygyny. Adults who have never been married are rare. Civil law regulates divorce and remarriage. The traditional extended family consisting of a married couple, their unmarried daughters, and their sons with their own spouses and children has become less common in urban areas. Children live with their parents until they are married. Traditional inheritance was through the male line, except for what women take as a dowry, while increasingly children inherit equally or by assignment. Cyril and Methodius University of Skopje. The Macedonian education system consists of: pre-school education, primary education, secondary education, and higher education. The higher levels of education can be obtained at one of the four state universities: Ss. Cyril and Methodius University of Skopje, St. Clement of Ohrid University of Bitola, State University of Tetovo and Goce Delchev University of Shtip. There is a number of private university institutions, such as the European University, Slavic University in Sveti Nikole, the South East European University and others. Regarding literacy, 96.1 percent of the total population over the age of 15 could read and write in 2002. The gap between rich and poor has increased since 1991, with Roms at the bottom, and social differences between urban and rural populations. Serbs and Aromanians benefit from the economy, while Albanians lag behind. Dress and behavior follows ethnic lines, although increasing urbanization and modernization has reduced this. Saint Bogorodica Precista Monastery near Kičevo. Saint Panteleimon church near Skopje. 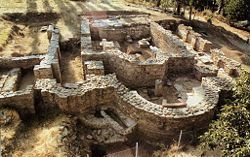 The archaeological sites include those at Stobi in Gradsko, Heraclea Lyncestis in Bitola, Lychnidos, the Church of Saint Sophia in Ohrid, and Scupi in Skopje. Terracotta icons were discovered at Viničko Kale (near Vinica). 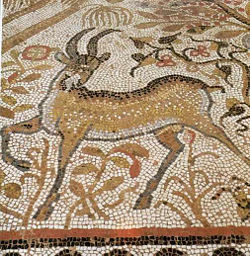 The Basilica Mosaic in Heraklea Lynkestis is an early Byzantine mosaic. There are many remains from Roman times and the early Christian period in Vardar Macedonia, which was at the time part of the Bulgarian Empire. Famous architects and fresco-painters worked on numerous churches in the Republic of Macedonia, and in Ohrid alone there are over 30 churches. UNESCO has declared that the city of Ohrid and its lake must be protected. Several churches, the most renowned among which is Saint Pantelejmon, bear witness to the times of the educator St. Clement and in 1990 work on the Cathedral of Saint Clement of Ohrid in Skopje was completed. 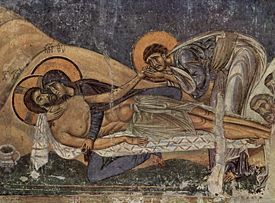 Along with other cultural monuments the eleventh and twelfth century churches of Eastern medieval Bulgaria (known today as the Republic of Macedonia) are famous throughout the world, characterized by unique architecture and priceless frescoes and icons. Monuments of Islamic culture such as mosques, bazaars and baths from the Ottoman Age have been discovered. In the fourteenth century, Skopje was described as being an important trading center with its Old Bazaar, Covered Marketplace (Bezisten), the Kursumli An Caravanserai, Daut Pasha Baths and the Mustapha Pasha Mosque. Another important monument of Islamic culture in Vardar Macedonia is the Painted Mosque in Tetovo. A large number of monuments were erected after the liberation of the city. The founders of modern Macedonian painting included Lazar Licenovski, Nikola Martinoski, Dimitar Pandilov, and Vangel Kodzoman, followed by Borka Lazeski, Dimitar Kondovski, Petar Mazev, and Rodoljub Anastasov. Vasko Taskovski's work was presented to the Paris public in 1992 with an imposing exhibition and auction of about 100 works. Vangel Naumovski, who was long classified by art historians as a Naive artist, is well known for his Ohridska Porta Gallery, as well as for the original world of his paintings. Contemporary Macedonian artists include Aleksandar Stankovski, Zhaneta Vangeli, Maja Dzhartovska, and Gordana Apostolovska who all use various styles. Sculptors include Dimo Todorovski, who is considered to be the founder of modern Macedonian sculpture, Petar Hadzi Boskov, Boro Mitrikeski and Tome Serafimovski. Macedonian cuisine, also referred to as Slav Macedonian cuisine, reflects Turkish, Bulgarian, Greek and Middle Eastern influences and to a lesser extent Italian, Mediterranean and Hungarian ones. The relatively warm climate provides excellent growth for a variety of vegetables, herbs and fruits. 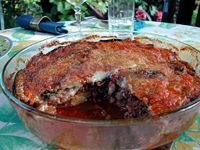 Various dishes include tavche gravche (beans in a skillet) which involves baking boiled beans mixed with onion, peppers, tomato, oil, flour and various spices, moussaka, ajvar a relish made from red bell peppers, with eggplant, garlic and chili pepper, and kebabs, among others. Famous for its rich "Shopska" salad, required at every meal, Macedonian cuisine is also noted for the diversity and quality of its dairy products, wines, and local alcoholic beverages, such as rakija and mastika. Female oro performed by Tanec. After the first generation of modern Macedonian classical music, consisting of Trajko Prokopiev, Todor Skalovski, Stefan Gajdov and Zivko Firfov, came the work of second generation composers like Kiril Makedonski, Gligor Smokvarski, Vlastimir Nikolovski, Toma Prosev, Tomislav Zografski, Mihailo Nikolovski, Ljubomir Brangolica and Risto Avramovski. The Macedonian Philharmonic Orchestra, established in 1944, is the oldest cultural institution in the field of music. 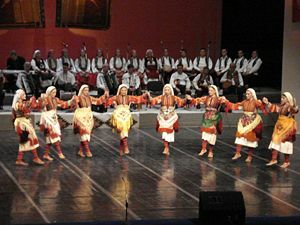 There are six chamber ensembles, such as Tanec, that represent the richness of Macedonian folklore and songs, and there are ten other folklore ensembles that are active. There are three professional and 20 amateur choirs. Each year about 50,000 people attend concerts of the Macedonian Philharmonic Orchestra. Several folk festivals take place each year. The oldest is Folkfest, held in Valandovo, and most festivals have greater turnouts among Macedonian expatriates in Australia and Canada. The Festival of Old Town Songs in Ohrid and the Ilinden Days of Folk Song in Bitola are events that celebrate traditional Macedonian songs. Mak-Fest in Stip and the Skopje Festival are the two best-known festivals of popular music in the Republic of Macedonia. The rock group Leb i Sol, with its original music infusing traditional folk themes and rhythms with modern influence, has been active for over 20 years and has become widely known both inside and outside Macedonia. There are 13 professional theaters in the Republic of Macedonia. From 1993-1994, 330,000 people attended 1596 performances in the newly formed republic. The Macedonian National Theatre (Drama, Opera and Ballet companies), the Drama Theatre, the Theatre of the Nationalities (Albanian and Turkish Drama companies) and the other theatre companies comprise about 870 professional actors, singers, ballet dancers, directors, playwrights, set and costume designers, etc. There is also a professional theatre for children and three amateur theaters. For the last thirty years a traditional festival of Macedonian Slav professional theaters has been taking place in Prilep in honor of Vojdan Cernodrinski, the founder of the modern Macedonian theatre. Each year a festival of amateur and experimental Macedonian theatre companies is held in Kocani. The word Karagöz is a Turkish word literally meaning "a black eye," but it is a specific type of theatre in the Republic of Macedonia as in many other Balkan countries. This picturesque, original and exceptionally popular theatre reached the Balkans from the Far East. The Karagoz Theater came to the Balkans together with the Ottoman Empire. Although this theatre includes a number of characters-puppets, its eminent theatricality emerges from the complex relation between its central masks of the characters Karagoz and Hadzivat. Karagoz personifies an ordinary Greek man living in the Ottoman Empire. Hadzivat (as the more educated of the two) speaks conceitedly using archaic words and poetical phrases, pretending to be wise and in actuality being a boringly pedant, rigid, corruptible, opportunist who constantly emphasizes his aristocratic origin. Karagoz Theater is Turkish folk humor at its best. In the Republic of Macedonia there are 34 sport associations, more than 1,500 active clubs, 150,000 active members, and more than 1,000 highly educated professionals. Darko Panchev received Europe's most valuable soccer player award in 1991. Other notable Macedonian soccer players include Toni Savevski, Boban Babunski, Goce Sedloski, Gjordji Hristov, Toni Micevski, Artim Shakiri, and Ilija Najdovski. The wrestler Shaban Trstena was a gold medallist at the 1984 Olympics in Los Angeles and also won the silver medal at Seoul Olympics in 1988. Mogamed Ibragimov won the silver medal at the 1998 World Championship and is a three-time European champion (1995, 1996 and 1999). Mogamed Ibragimov also brought the first Olympic medal for Macedonia since its independence. On October 1, 2000 he defeated the two time Olympic Bronze medalist, Amirreza Khadem Azghadi (Iran) to take home the bronze medal at the 2000 Olympics in Sydney. ↑ "The Macedonian language, written using its Cyrillic alphabet, is the official language in the Republic of Macedonia. ", Article 7 of the Constitution of the Republic of Macedonia Retrieved November 8, 2011. ↑ "Languages Law passed in Parliament", macedoniaonline.eu, 26 July 2008. Retrieved November 8, 2011. ↑ 3.0 3.1 Census of Population, Households and Dwellings in the Republic of Macedonia, 2002 – Book XIII, Skopje, 2005.. State Statistical Office of the Republic of Macedonia. Retrieved November 8, 2011. ↑ I bez popis ke se prebroime on Nova Makedonija. Retrieved November 8, 2011. ↑ 5.0 5.1 5.2 5.3 Report for Selected Country. International Monetary Fund. Retrieved November 8, 2011. ↑ Central Intelligence Agency, Field Listing :: Distribution of family income – Gini index World Factbook. Retrieved November 8, 2011. Macedonia Countries and Their Cultures. Macedonia U.S. Department of State. History of "Republic of Macedonia"
This page was last modified on 9 July 2015, at 17:05.